Happy Bloggers Challenge Friday! Thanks to those who played along with last weeks Things with Wings Challenge. This weeks challenge is Doilies. 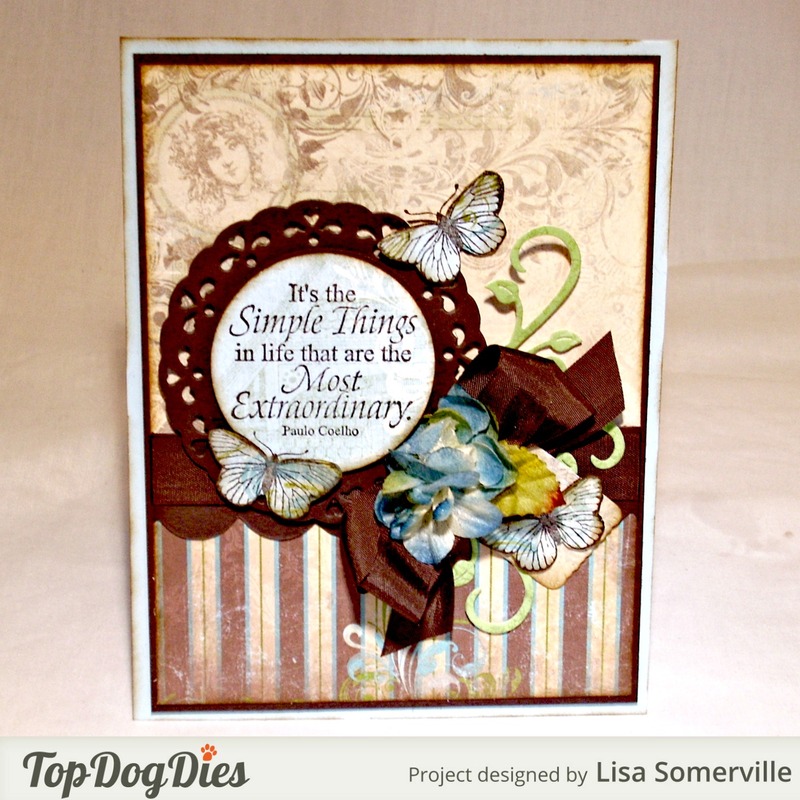 To created my card, I used stamps from Our Daily Bread Designs, Top Dog Dies and Bo Bunny pattern paper. I needed a longer scallop edge form card, so I used the scallop from Top Dog Dies Pocket Albums, scored my card stock and placed it just inside the cut line to create my panel. For this piece, it doesn't matter that the score line is there because it is getting covered up the the doily. 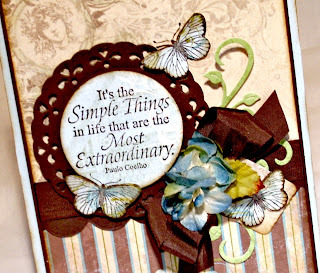 I cut the doily from Chocolate card stock using Top Dog Dies Cherish Doilies Set, then traced the center onto the Bo Bunny pattern paper and cut it out, adding the quote from Little Things in Chocolate ink. To embellish, I added a tag using the Darby Doily & Tags Die Set, Petaloo Flowers, Vintage Brown Seam Binding, flourishes cut from the Bo Bunny pattern paper using the Leafy Flourishes Die Set, and butterflies from the Stamped by Mini Butterfly that were stamped in Chocolate on scraps of the Bo Bunny pattern paper, then popped up on dimensionals. If you'd like to play along with this weeks Bloggers Challenge, please link back to this post on your blog and mention you created your card for the Bloggers Challenge Doilies Challenge. Please add your link using the Link Tool below, your link should be a direct link to your Bloggers Challenge Post, use your name as the Title. Please do not link to cards that were created prior to the challenge date. Entries not linking properly, or backlinked will be removed. If you have the captcha enabled on your blog, please consider turning it off, as it makes it so much easier to leave comments. Thanks for stopping by, have a great weekend! Elegant look with the papers you choose. Love all the layers and embellies. This is so pretty, Lisa! I love the look of the butterflies stamped on the patterned paper scraps. Wow! Your card is so lovely & elegant! Thanks for the inspiration!